Most security and loss prevention (LP) officials I know take great pride in being the eyes and ears of their organization. They’re always on the lookout for new ways to reduce losses and better protect employees and assets because they know that success in corporate security and LP extends to their entire organization. The fewer losses they experience, the greater the profit margin for their retail stores or bank branches. This focus on efficiency carries over into their technology choices as well. Good security and LP managers want a video surveillance system that’s easy to use and that helps them rapidly locate theft, fraud and other suspicious activity. After all, a shoplifter can be in and out of a store in 5 minutes. As an investigator, you don’t want to watch 12 hours of video to find a 30 second incident. Thankfully, advances in video management system (VMS) software technology have made it faster than ever to find the specific video evidence you’re looking for. But, it’s important to know what VMS features you need to help speed up your searches. Here are five key VMS features that can reduce the amount of time you spend looking through video surveillance archives and help you find the “right” video faster. Many businesses do not need to record video 24/7. Besides saving you time, selective motion recording will also save you storage costs because you’re not archiving hours and hours of video surveillance you don’t need. With this feature, video recording is triggered by motion in the camera’s field of view. This ensures you’re capturing any changes or movement in your scene, but also keeps you from recording video unnecessarily, thereby reducing the overall amount of video you need to search through. Keep in mind that in some applications where motion is continually present (for example, a busy street corner) this feature may not be useful. 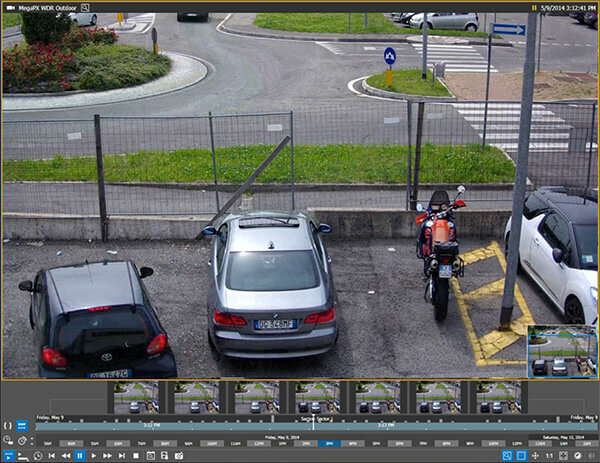 Motion histograms are visual indicators that display when video surveillance frames contain movement. In March Networks Command Client software, the histograms are situated above the timeline in the user interface, so you can correlate an incident to the date and time it took place. Command’s motion histograms are also reflective of motion intensity, so the larger the spike, the greater the amount of movement in the scene. This helps you quickly bypass video where nothing is happening, and pinpoint scenes with customer and or employee activity. Video thumbnails are incredibly helpful if you’re searching through video recorded over a long period of time because they let you conduct quick spot checks. You get multiple thumbnail images in a single view that you can quickly scan to see which one contains what you’re looking for. In this example below, you can see that the thumbnails at the bottom of the screen capture the moment the black car pulled into the parking lot. The first three thumbnails show only one car, but the fourth thumbnail shows two. In March Networks Command software, the thumbnails appear at the bottom of your screen above the timeline. You can refine your search time range easily by clicking the thumbnail that’s closest to the relevant evidence. With thumbnails, you can sort through a week’s worth of video in minutes. Smart search capabilities allow you to set up specific motion detection windows when reviewing recorded video, and retrieve a list of all events that occurred within that window. This allows you to search through the recorded video looking only for activity that matches your smart search settings. For example, a QSR restaurant that has a tip jar located near its point-of-sale (POS) system may suspect someone of taking money. 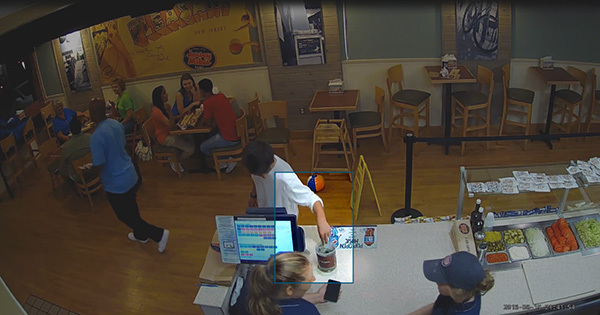 By setting up a motion detection window around the tip jar, investigators can very rapidly sort through hours of video to see when any motion was detected near the jar. They can skip over unrelated video (long periods of time when no one touched the tip jar) and sort through only video that shows movement around the area of interest. Want to really speed video investigations? Solutions that integrate business intelligence software let you proactively monitor activity across multiple locations so you can pinpoint suspicious behavior faster. Integrated solutions like March Networks Searchlight software, which combines video with POS data and intelligent video analytics, lets you search video based on transaction type or amount, store location or employee, or even by physical event, such as when back doors open. Maybe you have a store that’s consistently below revenue targets. With Searchlight, you can setup daily reports to review all voids and refunds at that store’s POS. You can then compare that data to your other stores, sort the list by employee, and drill down into specific transactions. You can also trigger alerts based on certain business rules so you’re notified when, for example, the POS is being used, but no customer is present at the counter. By regularly reviewing these reports, along with corresponding video clips, you can get a more complete picture of what’s happening at your stores and quickly zero-in on the reason behind the lost revenue. If you’re a security professional using a video surveillance system, think about how much time you spend trying to find the video you need. As described above, there are effective tools available that can save you time and money. In addition to faster video searches, maybe there are other tools and features you’d like, such as more customization, greater scalability, and better health monitoring. Put your wish list together, do your research, and ask for a demo. I read your “5 Must-Have VMS Features” article hoping to find a VMS feature I once saw on the web somewhere but can’t remember where. It allowed the user to see a camera’s motion footage for a whole day all at one time. So if a typical home driveway were in the camera view, the playback of the day’s motion would show – all at the same time – the kids walking out to the bus, the mailman dropping of mail, the neighbor walking the dog etc. So it would look like all these things happened at once. Then you could determine which which event to replay on its own. Can’t recall what it was called or who makes this capability. Do you happen to know of it? Thanks. I want to deploy 330 cameras in a campus project. monitoring will be at 4 posts each one with 1/4 of the cameras aproximately (80-90 each). Monitoring several cameras is an imposible task for a person, so it will help a lot is the monitoring center automatically can see only the cameras which have movement detected. This is, the display will show ONLY the images where movement is detected, if a camera is not detecting, then it will not be shown unless asked to.